Places of social economic significance, places of interest and places to visit. Detailing Singapore's cultural and historical highlights. Where to go? | What to see? | Where to buy? | What to eat? Changi Airport, the No. 1 airport in the world, has all the bells and whistles. It resembles an airport of the future with its avantgarde, indoor landscapes, open air gardens and kiddies playgrounds. Hungry? The airport terminal is stuffed with restaurants, food outlets and lounges. Rows and rows of shops line up both sides of its aisles for last minute shopping or souvenirs. The airport comes with free wifi and internet terminals. Take short naps in the napping areas for a fee or spend a night in the transit hotel. Seek out the fitness and spa centres if you want a work out. It even has clinics, pharmacies, supermarkets and a post office. What more can you ask for, really? Changi Airport has 3 terminals and if you somehow landed in the wrong one, just take the sky train. It will put you right on track to where you should be. Terminal 1 opened in 1981, Terminal 2 in 1990 and Terminal 3 in 2008. But there is more. Come 2019, Jewel Changi Airport, several years in the making, will open its doors to travelers and deliver boundaries transcending experiences. As a world-class lifestyle destination, visitors will be inspired by its eclectic mix of one-of-a-kind attractions and state of the art aviation facilities. It will also hold Singapore's largest air-conditioned indoor garden. The ever popular Orchard Road is a popular haunt. Ask any locals, expatriates and tourists and you will soon find out why. But it wasn't really like that aeons ago. In the mid-1800s, it was a plantation ground for nutmeg, pepper and fruit orchards. Stroll down the famous shopping district and see for yourself why Orchard Road is like the Ginza of Japan. You can easily lose yourself in the maze of haute courtre shopping malls, glamorous entertainment centres, restaurants and bistros. It is served by 3 MRT Stations: Orchard MRT, Somerset MRT, and Dhoby Ghaut MRT. Tanglin Mall is located at the junction of Tanglin Road and Grange Road. Expatriates and professionals enjoy patronising it. Anchor tenants like Tasty Food Court offers up to 15 varieties of local cuisine. Alternatively, head down the gourmet supermarket and bakery or check out Tanglin Market Place. 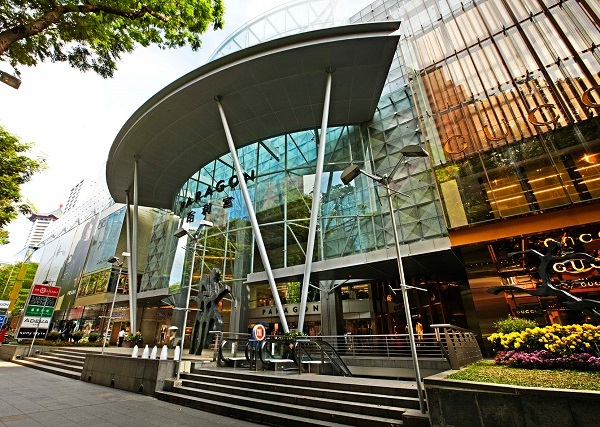 Ion Orchard is the icon of Orchard Road. It is a super high end shoppers paradise. It carries the world’s best loved flagship brands. Expect to pay through the nose. Emerald Hill is a cluster of highly sought after habitats where the rich Chinese originally set up their houses. Nearby Emerald Hill, Centrepoint’s Cold Storage supermarket is possibly the oldest surviving business establishment in the area. The Esplanade, ‘Theatres on the Bay’ is a place where you can fine dine, shop and watch the performing arts. It has a 1,600-seat Concert Hall and a 2000-seat Theatre. The concert hall features state-of-the-art acoustics. It is amongst six such halls known to exist in the world. The locals here call it 'The Durian' because of its durian looking spikes. Singapore’s Gardens by the Bay is Singapore's story of continual transformation from a "Garden City" to a "City in a Garden". Three waterfront gardens occupies 101 hectares of reclaimed land along the Marina Reservoir. The park has 3 zones - Bay South Garden, Bay East Garden and Bay Central Garden. The Sun Pavilion has the largest cacti collections in SE Asia's. It has more than 1,000 desert plants and 100 different species and varieties imported from Mexico to Madagascar. A bum-boat river tour along Singapore’s waterways promises a unique experience. The cruise will take you down Clarke Quay, Robertson Quay, Boat Quay and the Marina Bay, culminating with Singapore’s icon, The Merlion. The various riverfront establishments along this neighbourhood of quays offer their own unique blend of experiences. An incongrous mix of colonial structures and gleaming high rise skyscrapers is a sight to behold. If you want to peak out your river cruise outing, pay someone to croon you a couple of ballads. You cannot talk about Boat Quay without going back to its historical roots. 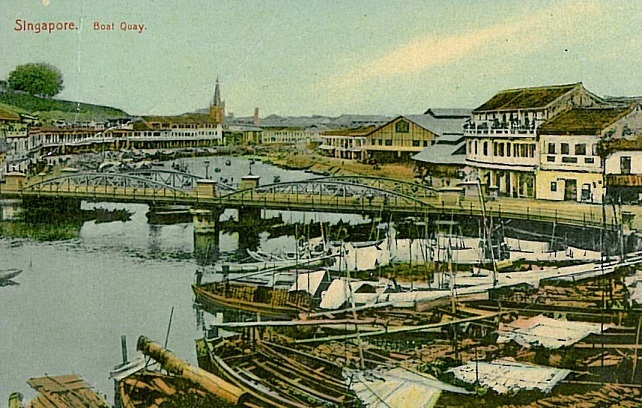 In its heyday in the 1800s, Boat Quay was doing three quarters of all shipping business in the island. Hundreds of bum boats fought for limited berthing space and coolies huffed and puffed these goods all the way from the river to the road. In the absence of machines, human sweat and hard labour ruled the day. Traders bought and sold many items, from rubber and tin to rice and coffee. Some of Singapore's leading towkay (Hokkien for boss) and philanthropists like Tan Tock Seng and Tan Kim Seng had their trading offices there. Boat Quay and the whole of Singapore River and its environs was gazetted for conservation in 1989. Under the preservation programme, the two- to three-storey shophouses, the five-foot way, the projecting upper floors have become bustling shops, restaurants and bars. Stroll down South Bridge Road, Circular Road, Lorong Telok and North Canal Road for some nostalgic memories. Looking for a place to chill out in the evening. Clarke Quay may just be the place for you. Restaurants, wine bars and night clubs have set up shop in retrofitted warehouses and refurbished Chinese junk boats. The ambience is just about right for some socialising including river cruises. The bars and restaurants along the Singapore River do serve up views of Marina Bay Sands while fascinating jellyfish-like covered walkways act as shelters between venues. The Clarke Quay MRT station is a short distance away. Vivo City is the largest shopping centre in Singapore. Take the train and alight at the HarbourFront MRT station. This shopper's paradise is huge, with hundreds of retail and shopping outlets, restaurants and entertainment centres. Sentosa and the gaming casino is just across the stretch of harbour. Hop on the Sentosa Express mono rail to get there. The terminal is on level 3, beside the Food Republic food court. Picture an island with pristine beaches. Sentosa, last known as Pulau Blakang Mati, is almost always on a tourist to visit list. Sentosa Island has more than two kilometres of palm lined beaches on its southern coast segregated into three sections - Palawan Beach, Siloso Beach, and Tanjong Beach. The Tanjong Beach offers solitude and privacy while Siloso Beach serves up a spread of skim boarding, canoeing and beach volley ball. The Resort World Sentosa and the Marina Bay Sands Integrated Resort will serve to bring in a huge pile of money for its operators. It is Singapore’s answer to Las Vegas’ and Macau’s casinos. Sentosa is the perfect spot for nature lovers. Take these eco walks and connect with the healing goodness of the woods. Other fancy spots to explore are Universal Studio, Songs of the Sea, Imbiah Lookout, Butterfly Park and Insect Kingdom, to name a few. S.E.A. Aquarium is the world’s largest aquarium. There are 800 species of marine animals. The Open Ocean with a panoramic view of leopard sharks, manta rays, goliath grouper, napoleon wrasse, and other gentle giant sea creatures gets the spot light. The Henderson Waves Bridge is an architectural wonder that hooks up two parks - Mount Faber Park and Telok Blangah Hill Park. The bridge is a 274 meter-long deck made from all-weather, yellow bakau wood slats. It resembles a masterpiece of artwork, with its wave-like structure and undulating curved “ribs” that double up as sheltered alcoves. Soak in the flora and fauna of the forests as you pass through tree tops. See the birds in their natural habitats or take in the panoramic views of the city, harbor and the Southern Island. Chinatown is an ethnic chinese heartland steep in traditional chinese culture and history. It is still popularly known as Niu Che Shui (牛车水) - bullock cart water to the older, pioneer generation of chinese. Chinatown is very popular with tourists. It is colourful, rich in antiques and handicraft works and vibrant with business activities. The local food is just beyond delicious. During festivals like Chinese New Year and Chingay, the place can get really crowded. Chinatown is a maze of temples, food streets and shop houses. There is also a hindu, Sri Mariamman Temple which is frequented by tourists. The Buddha Tooth Relic Temple and Museum houses a two-meter tall, 420 kg, solid gold stupa and the Sacred Buddha Tooth Relic Chamber is where the sacred Buddha tooth resides. The tooth relic of Buddha is claimed to be discovered in a collapsed stupa in Myanmar in 1980. Check out these places: Buddha Tooth Relic Temple, Pinnacle@Duxton Skybridge, Red Dot Design Museum, Singapore Coin and Notes Museum, Thian Hock Keng Temple, Singapore City Gallery and Baba House. Pamper your senses with a visit to: Rustic Nirvana - balinese spa | Qimantra - chinese massage | Spahaven - day spa | Bath Culture Foot Therapy - foot massage. Bring home some gifts from Tea Chapter - a tea shop or Yue Hwa - an emporium. A list of Shopping Malls: People's Park Complex | People's Park | Chinatown Point | Pearl Centre | OG's People's Park. Singapore Botanic Gardens was awarded the prestigious Unesco World Heritage site status in Bonn, Germany on 4 July 2015. The Gardens is valued for having two outstanding universal qualities - its role in the rubber trade which transformed the region in the 1900s and its unique tropical colonial gardens landscape. The gardens now joins two others - the 1759 Royal Botanic Gardens in Kew, England, and the 1545 Orto botanico di Padova in Padua, Italy, on the Unesco list. Singapore Botanic Gardens is a 74-hectare of botanics. It is a blend of rainforest, horticulture and parks. Attractions like the National Orchid Garden, the Ginger Garden, and the Evolution Garden are worth lingering a little longer. The National Orchid Garden is its main attraction. It has an exhibit of over 1,000 species and 2,000 hybrids of tropical orchids. Burkill Hall - a colonial plantation bungalow built in 1886 and the VIP Orchid Garden. Orchidarium, Coolhouse, Misthouse, Bromeliad House, Ginger Garden and Evolution Garden. CHIJMES is a nationally gazetted monument of beautifully structured, historic complex constructed in 1841, with a Gothic-style chapel added in 1904. The complex had served as a Catholic convent school for 132 years with 'Caldwell House' as its convent quarters. In its present incarnation, CHIJMES is an art gallery, shops, ethnic restaurants and entertainment centre. Its multi purpose function hall provides a venue for musicals, theatrical performances and weddings. Chijmes' city location, fine architectural, historical settings and unique ambience quickly became a draw, attracting premier F&B establishments and artsy dealers to be a part of the Chijmes experience. An extensive, local to international spectrum of cuisines of Italian, Japanese, French, Spanish, American and Cantonese flavours promise a unique dining experience. Chimjes is located at Victoria Street. National Heritage Board added a new Heritage Gallery titled " A Monument to Our History"
The gallery chronicles the history and architectural features of its performance arts venue. The Gallery was open by the National Heritage Board on Tuesday Jan 27 2015. A haven for connoisseurs – superior wines and exceptional cuisine of the season’s finest ingredients. Good for a perfect night out for that romantic overture. Dishes at KU DÉ TA are created for sharing. Recommended: Wild snapper sashimi & fresh summer truffle. It provides an extensive offering of crudites and platters, pasta, roasts, and artisanal cheeses. Modus Operandi - a meal is rendered more meaningful when shared with loved ones. As you feast on contemporary European cuisine with hints of Mediterranean flavours, a cool indoor garden and full ceiling height glass panels provide a view of the Marina Bay skyline and the Singapore Flyer.